- You’ll find Wildwood Cemetery in the landscape between Sanctuary, Malden, and Lexington. 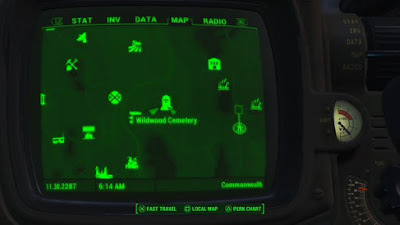 More specifically, it’s just south of Tenpines Bluff, on the other side of the nearest ruined freeway. You’ll probably stumble across the Cemetery when searching for Malden itself. - The Cemetery grounds are surprisingly calm. There are no enemies ‘mongst the gravestones - unless you brought them there yourself, anyway - and all you’ll find are flowers heaped at the graves. It’s a good place to pick up craftable items for your Chemistry Stations. You can also find a few boxes to plunder in a nearby mausoleum, as well as a burnt-out house on the edges of the Cemetery. - The only building of particular interest is a small mausoleum with a burning candle. When you go inside you’ll find a skull cupped in skeletal hands, and beside it two doses of Jet in a box. When you turn around you’ll probably be staring at some Raider Scum, and he’ll probably he swinging a Tire Iron at you. Use V.A.T.S. to quickly wipe him out. - So, uh, yeah, that’s it. Wildwood Cemetery is preeeetty lame, save for one little addendum. There’s a tree here that sticks out from the rest, in the middle of the paths that branch out throughout the Cemetery. If you check the base of the tree you’ll find a copy of Total Hack among the roots. Worth coming here? Sure, why not. This one allows you to hack Turrets, which is pretty awesome. There's like 12 ghouls there. Plus did you ever aim your gun at the cabin with the candle, the light goes out.